The 500 year old tower of All Saint`s Church can be seen from miles around, like a beacon guiding visitors into the town. 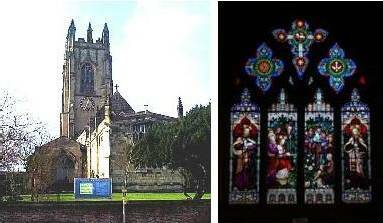 The Church of All Saints is a stately and well-proportioned edifice, of which its tower is its glory. It is all that a tower should be - simple and massive in its early stages, and then leading the eye up to dignified enrichment, which fitly crowns it and breaks the sky-line. There is a Decorated doorway on the west front, and in the upper stage are large belfry windows and considerable ornamentation. The battlements are bold and distinct, and the great corner pinnacles grow well out of the great corner buttresses.